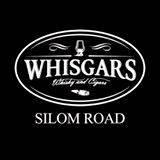 Whisgars Silom presents The Latin Lounge with DJ Cam mixing us a variety of tunes from Cuban to Salsa house together with percussionist Claudio! Muy Caliente! !